I’ve long been fascinated by our attraction to chocolate. | WHY DO WE LOVE CHOCOLATE? I’ve long been fascinated by our attraction to chocolate. cacao harvest, Santa Lcia Peru. Photo of cacao beans courtesy of Michael Nickel under the Creative Commons License. A lot of times, like with my kids, it appears to be just another way to get a sugar hit. However, while low-carbing, I discovered that a couple of squares of very dark chocolate satisfied my chocolate craving instantly. So what is it about the mysterious cacao bean that enhances human existence so well? Of course. You know how it makes you feel, don’t you? Chocolate, or rather, the cacao bean contains antioxidants, flavonoids, catechins and something magical called ‘theobromine’. There is no bromine in theobromine. The word comes from ‘theo’ – god and ‘brosi’ food. So this chemical compound has the effect of making chocolate seem like ‘food of the gods’ by enhancing serotonin levels in the brain. The small amount of theobromine in chocolate is safe and has several benefits to human health, such as lowering blood pressure at the same time as stimulating heartbeat. It has been shown to improve the condition of asthmatics and also contributes to chocolate’s reputation as an aphrodisiac. However, in large quantities theobromine is poisonous. Dogs, cats and birds should never be given chocolate as they are extremely susceptible to theobromine poisoning. 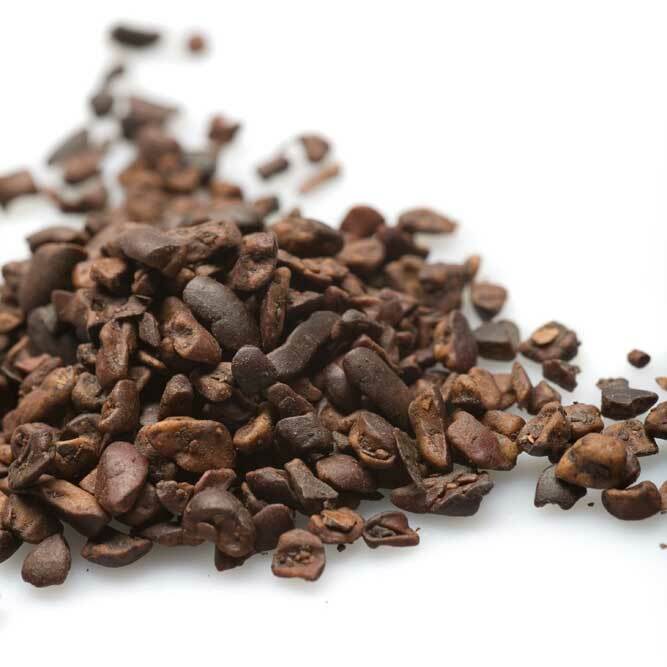 Cacao Nibs are the partially ground cacao beans that are the natural source of all chocolate products. With their crunchy texture and intense flavor, cacao nibs are healthy, gourmet, and a delicious addition to all kinds of treats. From adding them into a brownie batter, sprinkling on ice cream, or even just tossing into a trail mix, there is virtually no wrong way to add more of this real chocolate into your life. Plus, with cacaos soaring levels of antioxidants, and trace minerals like magnesium and iron, you can feel good in every way about enjoying this chocolatey superfood. 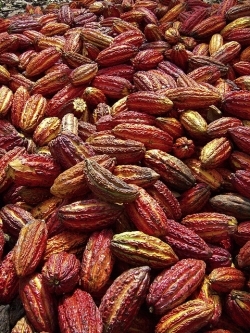 Chocolate comes from the beans or seeds of the tree, theobroma cacao. 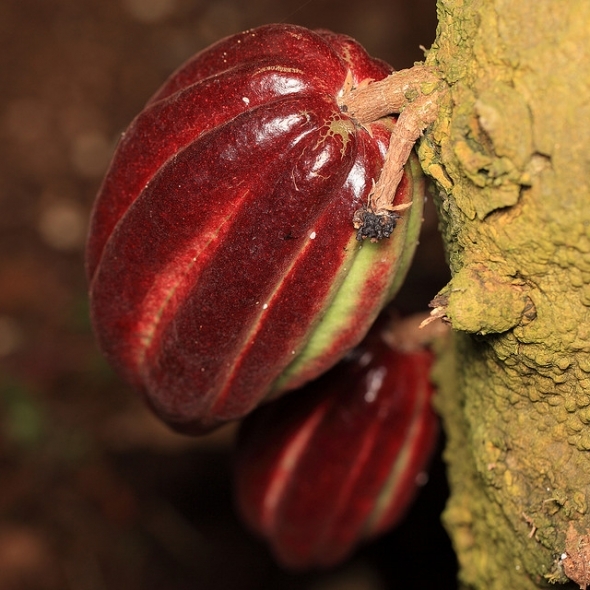 Theobroma cacao originally grew only in Central and South America but now is grown widely in tropical regions throughout the world. 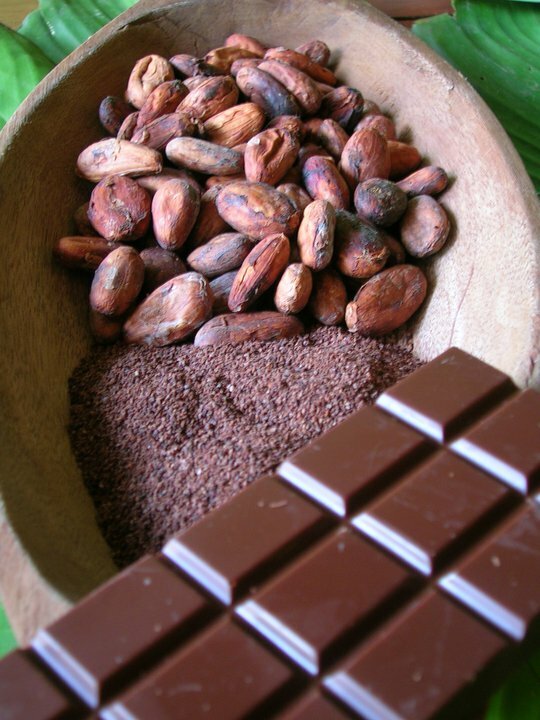 A large portion of cacao comes from Africa, where it is vital to local economies. After harvesting the beans are transported to the factory where they are roasted and bashed around a bit. The light, outer shells are removed and the broken beans are now known as ‘nibs’. These nibs are most definitely chocolate although they are very bitter. At this point, chocolate is at its most healthful to humans. Nibs can be used in cooking, added to cereals, eaten as-is or pulverised and added to drinks. They are definitely an acquired taste but once you get used to them, they become most enjoyable. Is Chocolate Really Good for Our Health? Or Is It Just a Scam? There is a lot of science about how great chocolate is for our health. Read this lens to see all about just how amazing dark chocolate really is. Check out all the studies that have been done proving that dark chocolate really is even more fantastic than we thought! It’s all about the science after all.